I found these in a flea market the other day while doing research for a potential project. I remember right after Desert Storm when the Coalition forces paraded down Broadway to celebrate their victory, and how the crowds cheered the American troops, but booed every one of the rest of the Coalition. It was embarassing. Desert Storm was, to many Americans, something more like a football game or a pro wrestling match, a form of entertainment. Collectable cards like these were part of that phenomenon. I remember resenting that attitude then, but only now do I know why: When 2003 came around, and the Iraq War was about to happen, I think most Americans still had the same vapid childish idea of what the war would actually mean, with the videogame-like Desert Storm experience still in mind. We went to war without caring about the consequences, without even knowing that any consequences were possible. I was in college in 1991 and protested the Gulf War, but over the years I’ve come to soften that stance quite a bit. I resented the jingoism, xenophobia, and empty confidence we had at the time, and I think that clouded my view of the potential, and eventually the actual, positive effects of subduing Saddam. My view was largely changed during the Clinton years, before the current Iraq War began. Since 2003, I’ve almost come to see Desert Storm as some kind of idyllic past. Seeing the image above of Powell and Cheney is, to me, frustrating: Many of the same men responsible for a well-conducted, strategically effective war in 1991 caused the fiasco we are in today. In the case of Powell, it’s because he sacrificed his personal values (i.e., the Powell Doctrine) on the altar of career advancement and blind loyalty. In the case of Cheney, well, I can only suppose that he was just as insane back in 1991 but was ultimately held back by cooler heads (i.e., Bush 41). I was extremely disappointed with Colin Powell actions pre-Iraq War, mostly since his actions gave the war a sense of legitimacy that it did not deserve. However, I don’t think his actions were the result of career advancement or blind loyalty. In terms of career advancement, I think it’s clear he has no presidential ambitions, and if you read his autobiography he seems completely unfazed at point by the possibility of his military career being over. While he might have some loyalty to various members in the Bush II administration, the suggestions that he fought heavily against the Iraq War (behind closed doors) contradicts the idea that he has blind loyalty any of them. Powell observed first hand the results of the Iran-Contra Affair. We could argue the reasons behind the fiasco all day, but in my opinion it comes down to a single source: unelected advisers in the president’s administration going above the president and making policy (obviously helped by having such a weak-willing president). Pre-Iraq war, we didn’t know for sure whether Hussein had the ability or desire to threaten our nation security. From Colin Powell’s standpoint, we didn’t have a strong enough case to go to war. From Bush + friends standpoint, we had a case. Advisers are in the end just that, advisers. They cannot just simply go the press every time they disagree with the President. In hindsight, it’s not very hard to figure out what Powell should have done (though if you really want to talk about hindsight, we should have done was given more to support the Shi’ite uprising after the Gulf War). Was the fact that war is much more important that most decisions enough to justify Powell going over Bush II’s head? If he had done just that, would that have stopped the Iraq War, or just eased support (particular international support)? It’s hard to speculate what the heck Powell was thinking. Maybe it was simply a lack of political spine: maybe he didn’t have the guts to do the kinds of back-room shenanigans it would have taken to force the President’s hand to either delay, prevent, or improve the planning for the war. I’m thinking, you know, leaking documents to the press, sending his own inspectors to Iraq, making off-the-record deals with foreign leaders, etc. Nixon’s advisors, for example, regularly disobeyed his orders when they deemed them just too insane to be taken seriously. Or maybe it was the opposite: Maybe without Powell we would have pulled the trigger on an even more hasty and poorly-planned attack, maybe we would have done something even crazier and stupider. Maybe without Powell the war’s results would have been even worse than they are now (if that is even possible). Maybe Colin Powell was the only thing standing between Bush/Cheney and a pre-emptive nuclear strike in Iraq. We may never know, but I tend to agree with you that he probably could have done more. I disagree with your statement that “unelected advisers in the presidentâ€™s administration going above the president and making policy” are the cause of the Iraq War problems. This absolves Bush of responsibility for his boneheaded decisions. While I think Bush lives in a factual bubble, I don’t think that he is quite that much out of the loop in terms of his ability to execute policy. I do think that he is constantly lied to by his advisors, and I do think they probably oversimplify things for him in order to steer him towards the decisions they want him to make. He calls himself “the Decider”, and I think that’s probably pretty accurate. Did he actually stand in a room in front of his team and make a decision to start the war? Yes. Did he know that we were sending less than 1/3 as many troops as we sent to the Gulf in 1991, to accomplish a task many times more complicated? I should hope so. Did he know that almost everyone in the Pentagon besides Rummy thought that such a plan was sheer madness? Probably not. Hmmm… If that’s what you mean by “over his head”, then yeah, I guess I do agree. I think you misunderstand what I mean by “unelected advisers in the presidentâ€™s administration going above the president and making policy”. In terms of the Iraq war, no one went above the president. In the end, Bush is 100% responsible for the Iraq war, and Reagan is 100% responsible for the Iran-Contra affair. However in Bush’s case, he doesn’t have anyone else to blame. My understanding is that the only way Powell could have stopped the Iraq war would have been to go over the presidents head (which is what I meant) and released documents saying we don’t have a case (or other behind the scenes black work). In which case, it would have been an unelected adviser directly setting policy (a policy that we do not invade Iraq), somewhat like Oliver North did in 80s (though the two are not directly comparable). No matter how good Powell’s intentions would have been, the Secretary of State has very little direct accountability, nor is he elected. Powell would have put himself in a position where he is essentially running the foreign policy show. Something that I do not agree with in principle. Now the situation isn’t nearly that clear. I think most people, back in 2002 (and perhaps even today), would much rather have Powell in charge of foreign policy than anyone else in the Bush II administration. I do note that had Powell gone to the Press pre-war he would be, at the very least, doing the morally right thing. However as much as I wish he had gone to the Press pre-war, and as much justification that we have today that he should have done that, I must consider the situation back in 2002. Did Powell have enough reasons to go the Press back then, and just didn’t act on it? My thought is that Powell likely had the reasons (almost none of the questions in the Powell Doctrine were answered), but felt that going to the public would be intentionally encroaching on powers reserved for the President. After all, I can’t think anything in the Iraq War that was/is strictly illegal (though nothing about the war is right in any form of the word). As of now, the only case were I could see Powell going back into a political position would be to help clean up the Iraq War, and under a Democratic president. As a side note, would you support Powell returning to the White House (not in any particular position)? IMHO, going to the press is not an exertion of executive power, and it does not illegally undermine the President’s constitutional powers. If Powell went to the press and said, in effect, that he and the President and the neocons had wildly different opinions about Iraq, and that his opinion was that an invasion was not necessary or even wise, he would have been acting perfectly legally (unless he revealed national secrets or something). He would have been fired, of course, and I think that possibility, ultimately, was what held his tongue. Every Secretary of State, by the way, is responsible for “running the foreign policy show”, albeit according to the President’s general direction. But the specifics are all up to the Department of State. When the SoS meets, say, the Syrian Ambassador, I’m sure the President leaves the SoS a lot of leeway about what and what not to say. Does the President know how the SoS will answer every one of the Ambassador’s questions? When it comes to the details, the SoS, and his undersecretaries, ambassadors, and emmissaries, have a lot of discretion. Also, it’s perfectly normal for members of the executive branch to use the press to publicly expose internal debates, sometimes with Presidential approval, other times with purely factional motivations. The thing about the Bush Administration that was different from most other previous administrations is that even the leaks (until recently) were entirely orchestrated by the Administration. I have somewhat close-ish connections with Powell (three degrees of separation) and understand that he’s a good man. But no, he’s so sullied now that he can hardly be trusted by anyone he might work with, right or left. I suppose he still has time to rehabilitate his reputation via a nasty tell-all book, but barring that I wish him a happy retirement. 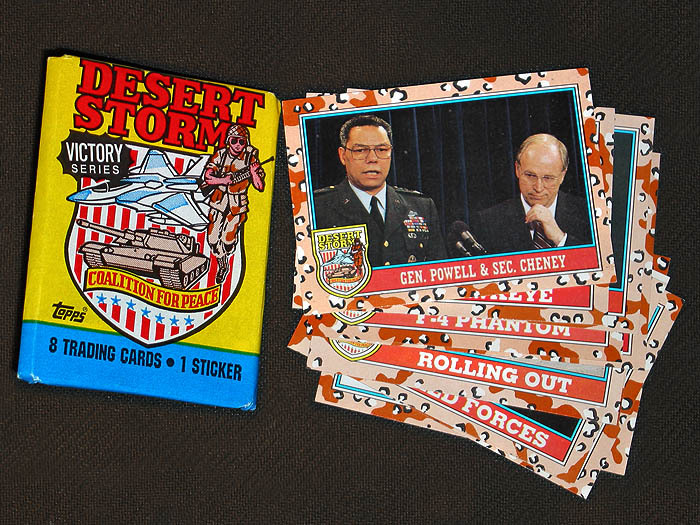 I’m a United States Marine Who served 1990-1994,I was in Desert Storm,we didn’t know a whole lot about what was going on over there except what we were told.I havn’t seen much on the war but,I did find a few of these Desert Storm Victory Series boxes which I purchased at $2.00 a box at a yard sale.I’m proud to have served my wonderful country.